Scrap metal recycling, or “scrapping” as it has become known throughout the industry, has become a pretty big business for those who were ready to make the leap from weekend collector to full time scrapper. With the payout for recycling scrap iron and salvage continuing to rise, as valuable scrap metal continues to be in demand, the competition for scrappers in some parts of Southeastern Massachusetts is getting tougher. Scrap metal business owners are now looking for new ways to stand out from the crowd and to establish themselves within a niche area of the industry. What Is Construction Scrap Removal? We have talked a lot on these pages about working together with local businesses that are known to produce regular amounts of scrap metal that can be collected and turned in for a profit. One of the largest industries that scrappers should be working with in this area is construction. If you can establish yourself as a trust-worthy, reliable and consistent service within the construction industry, you will get more scrap iron and salvage from job sites around the South Coast region than you’ll know what to do with. Working directly with construction companies and contractors, you can establish a construction scrap removal plan of action for every stage of the project. By setting up specific pick-up times and being available to make extra pick-ups on an on-call basis, you can save construction companies and work crews the time they need to meet deadlines. Knowing what type of scrap metal recycling you will be doing during pick-ups is also beneficial, saving you time on sorting before heading off to the local facility. 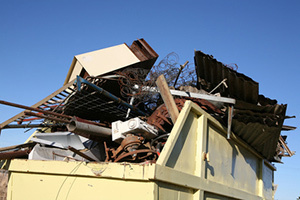 There are three different ways that construction companies and contractors typically work with scrappers for the removal of scrap metal recycling items from the job site. The type of relationship that you establish with your clients will be dependent upon your abilities, your costs, their needs or demands and of course making sure that you get the best prices for scrap metal in Taunton and the surrounding area. Free Pick-Up Services – Some of your clients are just so happy not to have to remove the scrap iron and salvage items from the job site, which can cost a lot of man hours in loading, removing and selling to local scrap metal recycling facilities. You can post “free pick-up services” in the local Penny Saver, Craigslist and newspapers to get more local business from construction companies, commercial businesses and residential property owners. Make flyers and bring them around to construction sites offering your services. They can always counter-offer and negotiate if they want to use another method of construction scrap removal. Pay for Pick-Up Services – You will find that some construction companies are looking to pay scrappers to pick up scrap metal recycling from the job site. Many believe that by paying for such services, the service they receive will be more professional and reliable than just calling someone to pick-up those items for free. This is a win-win situation for the scrapper, who can now make a flat fee for picking up the materials and hauling them away, plus of course the money made by selling scrap metal recycling to the local facility. Making sure that you get the best prices for scrap metal in Taunton by visiting Mid City Scrap Iron & Salvage, will help to boost your profits even further. Profit Sharing Services – Another way that construction companies and contractors like to work is to negotiate getting a percentage of the scrap that you are selling. In essence, they want to sell you their scrap metal so you can sell it to the local scrap metal recycling facility. It is important to consider the value of such an agreement, taking into consideration the amount of time you will be investing in picking up said scrap iron and salvage from the job site, the amount of fuel you will be using to pick-up and haul the scrap and the amount of money you will get for selling the scrap. Take the time to do the research on this type of agreement before jumping in just to get the job. In fact, research this type of service ahead of time and get a price in your head before you go out to solicit work so you’ll be ready with an answer right away. Nobody wants to have to collect all of the scrap iron and salvage from a job site and haul it off to the local scrap metal recycling facility. However, as someone who works in the industry, you know where you can get the best prices for scrap metal in Taunton or anywhere else in the South Coast region. As a result, even less-desirable metals can be sold for top dollar at Mid City Scrap Iron & Salvage in Westport. Your goal is to make your services convenient to your clients, providing quality construction scrap removal in a professional manner. One job can lead to dozens of referrals and a job well done can earn you repeat business. Reputation is everything – even in the world of scrap metal recycling. Construction scrap removal involves being always available to construction companies and contractors who typically require immediate pick-up and haul away service for the scrap materials that are “produced” on the job site. Think about the types of materials that you are willing to haul away in order to get the job. While you might only want certain types of metal, it would be in your best interest to accept all types of metal to provide a complete service to your clients so they don’t have to call around to multiple scrappers to get the job done. If you operate a scrap metal recycling business or if you are just getting into scrapping as a way to earn some extra money, make sure that you are getting the best prices for scrap metal in Taunton or anywhere else in the South Coast region. Located in Westport, the family-owned and operated Mid City Scrap Iron & Salvage has been providing services to local scrappers and clients throughout Southeastern Massachusetts, Rhode Island and on the Cape for nearly 80 years. Visit our website for more information on hours, directions and the procedures we use at our local scrap metal recycling facility.